Brett Gardner will be a Yankee in 2019. The Yankees decided to buy him out of his $12.5 million option for next season for $2 million and give him a $7.5 million one-year deal, saving $3 million and giving themselves outfield depth, which they desperately lacked in the second half of the season. The return of Gardner has been a touchy subject as the longest-tenured Yankee is viewed as the unofficial captain of the team, and it’s been hard for Gardner fans to accept his decline. Generally, all Yankees fans like Gardner and appreciate the career he has had and what he has meant and produced for the team for over a decade now. But was it the right move to bring back the 35-year-old outfielder, who will turn 36 during the upcoming season? I have been torn on this decision for a while. I have always been a Gardner fan, despite his streakiness, but it sure looked like he was done for most of the season. To determine whether or not Gardner should have been re-signed, let’s look at the good and bad of his return, starting with the bad since everyone always asks for the bad first. Gardner batted .236/.322/.368 this season. That’s the worst batting average and on-base percentage and second-worst slugging percentage of his career. His .690 OPS was also the worst of his career. It’s never good when a 35-year-old puts up the worst numbers of his career in the final year of his contract and then the team brings him back for another season. Gardner started the season the same way he has for the past several seasons: batting leadoff. But eventually his on-base percentage got too low to justify giving him the most potential at-bats over the course of a game and season, and starting Sept. 1 he was no longer batting first most of the time. (Tip of the hat to Aaron Boone who was willing to pencil in Gardner as his leadoff hitter for the majority of the first 135 games of the season despite his drastic decline in production. Just another example of “A’s across the board” for the manager.) For the last month of the season, Gardner was the Yankees’ No. 9 hitter … when he played. The trade for Andrew McCutchen resulted in Gardner no longer being an everyday player for the final month of the regular season and into the postseason. 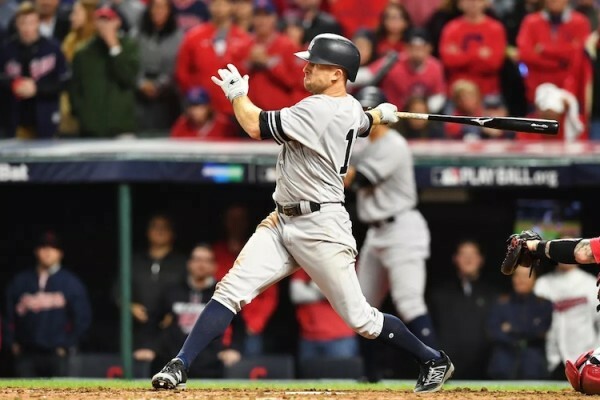 It took an Aaron Hicks injury in Game 1 of the ALDS for Gardner to play the next two games of the series, and it took McCutchen being a complete non-factor at the plate for Gardner to remain in the lineup. After struggling to find and maintain any level of offensive production during the regular season, Gardner went hitless in the playoffs (0-for-8 with three walks) and looked completely overmatched at the plate. The Yankees weren’t good enough to reach the World Series in 2017. They weren’t good enough to get out of the first round in 2018. I’m not sure that continuing to bring the same exact team back once again is going to get them over the hump. While Gardner might be very, very, very low on the list of reasons why the Yankees were eliminated short of their goal the last two seasons, his situation was a fixable one with the $2 million buyout. Gardner has been everything you want from a Yankee over a decade. He was a good, solid fourth outfielder/role player turned everyday center fielder turned everyday left fielder (thanks, Brian Cashman for signing Ellsbury!). He is the longest-tenured Yankee and though Judge is certainly the face of the franchise, it’s Gardner who is always there for a quote or state of the team when the media comes calling. From everything you hear and read, he’s an excellent leader and great clubhouse presence, and those things do matter. Even with his ugly offensive season, Gardner still plays incredible defense, as shown by his Gold Glove finalist nomination. He plays left field at Yankee Stadium better than anyone, and the difference between having him in left or Stanton or anyone really is night and day. For all of his flaws in the batter’s box in 2018, Gardner did bat .264/.350/.428 with a .778 OPS and a career-high 21 home runs in 2017. So he’s only one year removed from the best power showing of his career. Maybe there was an unknown injury or underlying reason why he fell off this past season. Maybe this past season wasn’t the beginning of the end, but rather an anomaly. Maybe after an offseason of rest, 2017 Gardner will be the Gardner the Yankees are getting in 2019. Gardner might not have the stereotypical power that comes with left field and left field in the American League, but he won’t give away at-bats, will make every pitcher work to get him out and when he’s going right, he will get on base. Sure, he’s streaky, and there’s a reason why I have called him “The Streak” for a long time now, but the idea is that his hot streaks will outlast his cold streaks in 2019. If they don’t, well, the Yankees are still getting Gold Glove defense and a leader for $7.5 million, and if it doesn’t work out, he can return to the bench where he finished last season.